Smalley Wave Springs can be manufactured quickly and economically to meet your requirements. Smalley's No-Tooling-Cost™ process allows for specials from .200"-120" diameters in carbon, stainless steel, or other exotic alloys. Prototypes in as little as two weeks. Reduce spring height by up to 50%! MICROMO (FAULHABER Group) introduces the new 8- and 10-mm brushless motors. The 0824 offers speed up to 85,000 rpm and continuous torque up to 1.09 mNm. The 1028 offers speed up to 66,000 rpm and continuous torque up to 2.1 mNm. The new high-performance motors can be used with a variety of FAULHABER Group encoders, gearheads, and controllers. Click here to learn more about MICROMO's latest motors. More than 10 years ago, U.S. Army researchers saw potential in flexible displays. With nothing in the marketplace, the Army decided to change that by partnering with industry and academia to create the Flexible Display Center at Arizona State University. Teams of researchers have scored significant breakthroughs since and racked up more than 50 patents. Click above to get your Protomold Design Cube. John Shook, chairman and CEO of the Lean Enterprise Institute, is growing ever more leery of cries for "strong leadership" of the hero variety with the leader exercising command and control, telling the troops what to do. This view not only misses the point, says Shook, it obscures the real issue. The issue isn't "leadership" at all; it's what leadership accomplishes. Northwestern University's Yonggang Huang and the University of Illinois' John A. Rogers are the first to demonstrate a stretchable lithium-ion battery: a flexible device capable of powering their innovative stretchable electronics. Where in the past only special vehicles were capable of checking permitted axle loads, future vehicles will be able to calculate this information -- and more -- automatically on the basis of data from tire pressure sensors being developed by Continental. 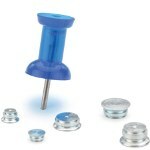 PEM SpotFast self-clinching fasteners enable two sheets to be joined permanently in a flush-attachment connection without protrusions on either side. These practical alternatives to riveting or spot welding provide ideal solutions to attach two metal sheets too thin to weld, fasten sheets of unequal thicknesses, join dissimilar metals, attach ultra-thin metal sections, or join metal sheets to PCB or plastic panels. Their rotational capability offers additional application advantages by allowing the fastener to act as a hardened pivot point. SpotFast fasteners install smooth with the top sheet and flush or sub-flush with the bottom sheet. Can be installed in aluminum or steel sheets as thin as .030 in./0.8 mm. Wouldn't it be great if you could take your design and put a virtual model of it on the table right next to you in the room? That way you could look at it next to real products, slide and spin it around on the table, and get a complete sense of the product's true size, scale, and proportions. Well, now you can do just that. IEE offers a wide range of rugged, military-qualified handheld control display units (CDUs) that are sunlight readable and combat proven. Display sizes and resolutions are available from four-line 2.8-in.-character displays up to full graphic displays and from 3.5-in. QVGA to 7.0-in.-wide SVGA. Typical uses for IEE's rugged CDUs include soldier- and vehicle-mount equipment and man-pack handhelds. Browser-based versions of the CDUs access the Web through a 10/100 Ethernet interface executing HTML 5.0, JAVA scripts, JAVA applets or other methods. 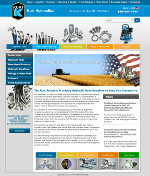 Kurt Hydraulics has launched an easy-to-navigate, redesigned and expanded website. The all-new site showcases Kurt's comprehensive line of SAE hydraulic hose products and components for creating total hydraulic system solutions. The site makes selecting the right solution effortless and features detailed sections on the company's entire product lines of hydraulic couplings, hydraulic hoses, hose guard products, crimpers, fittings, and other parts. PITTMAN Motors, a unit of AMETEK Precision Motion Control, offers customized motor designs for high-end motion control applications. Highly customized DC motors, such as the one pictured, can be designed to meet strict customer specifications for use in extreme environments or demanding applications. The motor's outside is built using stainless steel for the housing, flanges, and shaft. The motor's inside is protected from debris and moisture using a combination of seals, including a dynamic labyrinth seal on the front mounting surface and o-rings between the flanges and housing. The four-pole brushless motor shown was optimized for 24/7 operation at speeds ranging from 500 rpm to 15,000 rpm. LMS International has released Rev 12 of LMS Test.Lab, its integrated testing solution for noise-vibration-harshness (NVH) engineering. 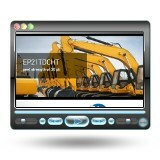 Rev 12 introduces a wealth of new features and enhanced solutions. In particular, it substantially improves the results accuracy of Transfer Path Analysis (TPA), one of the key analysis methods in LMS Test.Lab. As a systematic method to detect root causes of NVH problems, TPA is widely adopted across many industries. LMS has developed technology innovations that drastically speed up TPA processes. GM's first use of a heat-activated shape memory alloy replaces a heavier motorized part on its new seventh-generation Corvette. Although small turbocharged engines are marketed as delivering the power of a large engine with the fuel economy of a smaller one, Consumer Reports tests have found that they often fall short of expectations. Many turbocharged cars tested by CR have slower acceleration and no better fuel economy than the models with bigger conventional engines. Master Bond epoxies feature outstanding physical strength properties for high-performance bonding, sealing, coating, potting, and encapsulation. These polymer compounds are formulated to meet challenging physical strength requirements. Learn about the compression, flexural, tensile, shear, and peel strengths of Master Bond adhesives. 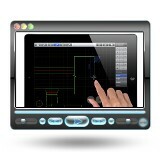 An engineer and an architect in London, UK, have created an impressive CAD app called "cado" for iPad that may soon have engineers in the US producing quick, detailed vector-based designs with just a touch here and a swipe there. Check out the demo produced by their company, Orange Juice Studios, and see if you think their claim to be able to draw anything from "microchips to milkyways" on an iPad will work for you. The patent-pending OMouse keeps your on-screen accuracy and control in check. App release date is 2Q 2013.